Biltong is a much loved South African delicacy made with dry cured beef or game meat and flavored with spices such as whole coriander seeds. The spicing of biltong has been attributed as a Dutch invention, however, the act of drying meat as a form of preservation has been practiced in Africa for centuries and is still the case presently. It is most useful, even today, in regions which are deprived of electric power for refrigeration. Hence when a meat stew is made in these areas, it is quite typical to use dried meat or biltong with a little peanut butter to make a stew. The addition of peanut butter to enrich the stew is most likely done because meat is not normally affordable, therefore another source of protein is sought to supplement that which would have otherwise been consumed from the meat. Making this stew is easy because all of the ingredients can be consumed as is, therefore not much cooking time is required. On the other hand, this stew may not be a suitable home staple for practical reasons, as biltong is quite expensive. If you don't want to spend that much money, you can still make this stew. Just use chicken breast and 2 strips of smoked bacon to enhance the flavor. If you like the idea of a peanut stew, try ​maafe. This is best served with polenta and a side of green vegetables. 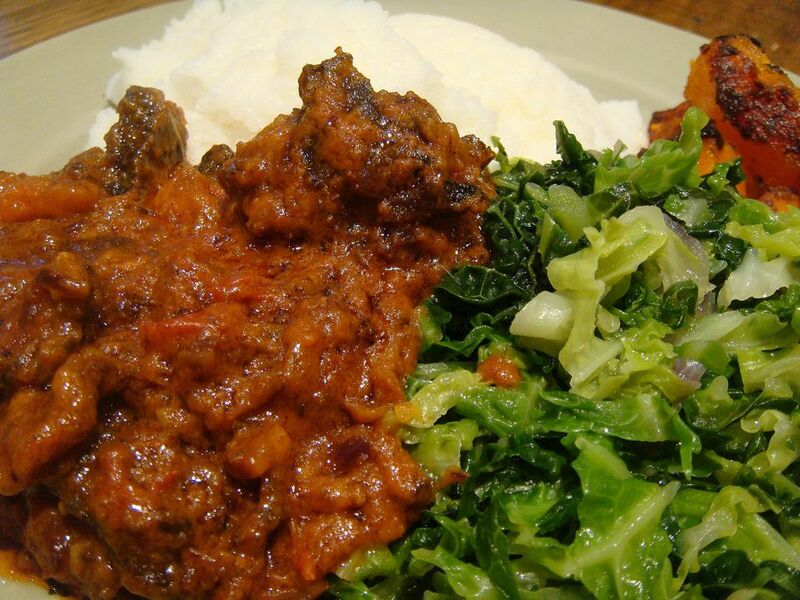 Traditionally, it is served with sadza and cabbage as pictured. Fry the chopped onions, garlic and ginger in the oil for a couple of minutes or until translucent. Add the biltong and stir around for a few seconds. Now add the tomato puree and peanut butter and stir to coat the biltong. Add the chopped tomatoes and cook for 5 minutes until slightly reduced. Pour in the water and simmer for 10 minutes until the stew has reduced to a very thick sauce. If using chicken breast, ensure the pieces are fully cooked before eating.